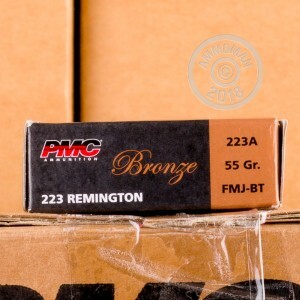 This 1,000 round case of PMC ammunition in .223 Remington is a great choice for AR-15 owners. Manufactured in South Korea by a top defense contractor that also produces .223/5.56 NATO for the South Korean military, these rounds undergo extensive quality control processes and are made of internally sourced components including non-corrosive Boxer primers and reloadable brass cases. The 55 grain full metal jacket bullet produces ballistics comparable to those of M193 ball ammo, with a muzzle velocity of about 3,200 feet per second. Each case contains 50 boxes of 20 rounds each. 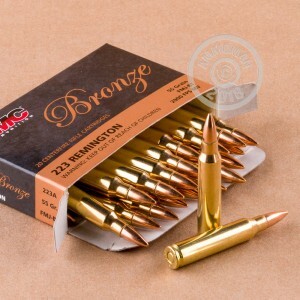 In addition to serving as the primary rifle round of many militaries around the world, the .223 Remington/5.56 NATO cartridge is popular among civilian shooters of AR-pattern rifles and hunters of small and midsized game who value its excellent intermediate-range performance. Buy this case or any other items totaling over $99 to qualify for FREE shipping from AmmoMan.com's warehouse to your doorstep. You pay only the list price. Been dealing with Ammoman for 5 years, many thousands of rounds of many calibers. Never had an issue with ammo or delivery. Best value I've found . I highly recomend and will continue to order..Thanks Eric! I have run thousands of PMC 223 and 556 through my AR with zero problems on feed or fire. Meanwhile, the bullet always goes where the gun is pointed. The action does not get loaded up and is very easy to clean. PMC is my go to for everyday shooting. This ammo was as advertised. feeds good and have not had any issues at all. As always great (and fast ) shipping. Great ammo at an affordable prices! Shipping was really quick as well, I highly recommend to buy from Ammoman. Good stuff and goes down range just fine! I am new to shooting, and I had this product (and web site) recommended to me. I've enjoyed every minute using this ammo at the range. Very thankful to have found this site. Repeat customer here, and I'll be back. PMC .223 is excellent for 3 gun competition, reliable and accurate. Shipping was fast and the free shipping is awesome. Ammo Man can be counted on for the best price, and fast, free delivery. I have bought thousands and thousands of rounds with no problems. Great Price. Quality Ammo. Simple and Fast service - Always check Ammoman first! Order was shipped very quickly, great communication from their team members. Nothing I can say to the negative. Thanks! Received my package very quickly just as described, just in time for the range. Was very satisfied, will definitely be ordering again soon. Shipping was fast. Ammo is exactly what I ordered. I purchased the ammo for my new AR. I have shot 50 rounds and no problems. I will purchase some more. These are loaded cold and may not cycle some rifles consistently. Bushmaster XM15 E2S loves this Ammo! Just finished up the 1000 rounds with my son today and not a damn problem at all. We go to our local outdoor range and usually unload 300 rounds at a time. I like the pmc because it doesn't jam or no shell casing get stuck like steel does. it takes about 7 days to get to me but thats alright,it's coming from jersey which is a long way from me. Overall the product and the free shipping are worth it,I've priced other outfits and this is the best! Thanks Ammoman I'm a customer for life! PMC are great for the price and run very well. I got them in good time with no shipping fees, which was great. PMC is excellent ammo and I've had no problems and I'll buy more in the future. Service and selection from AMMOMAN is a step above. 90 rounds in so far so good. Great Ammo and a good price! Got just what I ordered, on time, no surprises, no excuses. Good ammo, Fair price. That's as good as it gets. I am so very pleased with all my purchases. Your products are top quality and reloadable. Weather here in Reno has been bad so shooting has not happened for a while. Plus the flu, thanks again for great pricing free shipping and a quality product. Larry in Reno. Great product and quick shipping!!!!!!!! Great overall experience, I have purchased 4,000 rounds of .223 over the last month and highly recommend Eric and AmmoMan for your ammo needs!!! Really good ammo, Range friendly!!!! The rounds were good for general shooting and target practice. I had no problems with the rounds and will purchase them again. About 300 rounds no issues. Shot only 120 rounds at a 100 yard paper target and had no accuracy issues or any other problems. I will definitely buy some more! Great price super fast shipping! Fast service and as advertised. Great deal on good ammo. I have never had a problem with PMC they make a good product. Ordered on Saturday and received on Wednesday. Great Ammo, No problems at all! It's my first experience with PMC ammo. Ran flawlessly with zero hiccups. Very satisfied. Very fast delivery from Ammo and arrived in great shape. You have gained my business. Love this stuff. Ran 500 rounds thru a new Tavor X95 without fail. Saving the brass for a friend. Ordered two more cases. May it always remain so available and affordable! Excellent ammo for the money. No jams or misfires. Will buy more. New, clean, reloadable, reliable. What's not to like. Ammoman's price is Most Excellent and shipping is PDQ! Not the hottest ammo but What the Hey! Stocking up myself. Good price and arrived quickly! Will definitely purchase again! I haven't been to the range yet, but can't wait!! Ammo shoots really well plus excellent shipping! Awesome shot 500 rds breaking in new ARs not one feed jam or misfire! Very consistent and high quality. Will buy again! Can't find a better price on ammo and free shipping is a big plus. I wouldn't order from anyone else. My first gun (Ruger AR-556) and no fails after 500 rds. Two friends and I went together to get the 1000 rds. And since, I have bought a second 1000 rds. of PMC. Fast delivery, best price found and FREE shipping are best buying points with Eric. Ammoman keeps my business. Great stuff and worked well. I was very happy with the delivery time and the quality of this ammo. I will definitely order again. Ammo in good condition and arrived as expected. Get it now Californians, before you wind up in a government database for purchasing ammunition. I WON'T buy CA ammo ever again. Ammo was great for the range. Never had an issue. Will be ordering more and recommending to others. This is my first purchase with ammoman and it will not be the last. I was already familiar with this ammo and I'm happy with how it performed. Shipped very fast, went shooting today was great. Great shooting Ammo. No FTF and all feed well. Will order more Ammo from ammoman.com. My ammo arrived in less than 48 hours after I ordered. Very impressed. It's a great ammo definetly suggest it. I have fired over 2500 of these 223 and not once have ever had one not fire correctly. I have 5 different rifels that will shot the 5.56/223 and it works great in all 5. GREAT AMMO AT REASONABLE PRICE, SHIPS FAST. COULD NOT BE EASIER. AMMOMAN IS THE PLACE FOR AMMO! Now is the time to buy this great product. Excellent quality & fast shipping. I saw the great prices so I bought a 1000 rounds of it since my friends and family all come to my range to shoot.Its great ammo for shooting and practicing with.Its just great all around ammo that will work in both the AR15s and the older Ruger Mini 14s that can not handle the pressure from a 5.56 military round.The ammo burns clean and the primers are nor corrosive.The brass is re-loadable and not as hard on the chamber as a steel round. This is the most consistent and tightest group shooting factory ammo for AR-15's bar none! Since 2007, I have tried every brand of 223 Rem ammo made and over 1,400 hand load combinations and for factory made ammo the PMC 55-grain FMJ bronze tip cartridges fired in 16", 18" and 20" AR-15's it is by far the most accurate consistent tight-group shooting ammo of all with groups ranging from <0.25" to 0.50" at 100 yards depending, whether the rifle shot had a scope on it or red/green dot system. Very happy with the discrete packaging. Very happy with the ammunition. Thrilled with the price. Cost of shipping: zero. Ammoman is the best. Super fast shipping. .. I will purchase more soon. ...Pleasure doing business with you ...Thanks Ammo man! Best price anywhere . Will buy again . Great for all around practice . Will buy again . loved the ammo. arrived quick and worked great. I got a great price. I purposely did not go with the cheapest starting out with a new Ruger AR 5.56. Fired about 130 rounds at the range with zero problems. Delivery a little slow since we do not live in a big city but not an issue. My order was rec'd supper fast and now I've fired about 50 rounds and now problems. It is an excellent product and the price is a good deal. I enjoy shooting this ammo. When it comes time to order again it will be PMC Bronze from Ammoman. Everything from price to on time shipping you guys have it all together. Thanks. First time user of this caliber of ammo. Found it to be dependable and the results are what I expected. Great price, fast shipment will buy from ammoman again! I thought this PMC ammo was a quality product. I just made it out to the range this weekend and I was very pleased with the ammo. The brass was clean and the ammo fired well. I fed about 450 rounds thru my Stag AR without one misfire or misfeed. I will definitely be buying more!! Thanks for selling a quality product. Great price. Fast delivery. Easy site to navigate. I'll be back. I am a repeat customer and this ammo is great for both bolt and semi-auto. At a good price also. I have shot this ammo before and it is predominantly the ammo I have and prefer. So it is in my stash pile!! I do wish I could get it in another type of bullet such as SP or JHP. That is the only improvement that could be made in my book. Ammo was awesome and delivery was extremely fast! Quick delivery, exactly as promised! Clean ammo, no problems using the rounds in my AR15! Great price, great service and fast delivery. Recommend this dealer for all your ammo needs. I was extremely satisfied with this ammo. Only shot 20 rounds plinking with my AR556 Ruger. Very quick shipping, will buy more! Extremely satisfied with this ammo. Only shot 20 rounds plinking with my AR556 Ruger. Very quick shipping, will buy more! Best target practice ammo for the best price, anywhere. Shot well out of my ruger American ,no issues with miss fires or groupings,like the round!! good service, and good ammo. Nice to buy ammo from a dependable and honest source. I have shot several hundred rounds of PMC with new rifles, and broken in guns. Not 1 flaw in any of it. I will buy more from Ammo Man when I save enough money for another 1000 rounds. Damn good price too. Ammunition as expected. Fast shipping, far below local brick-and-mortar stores. No tax! The price is great, the rounds are great, and shipping was free and super fast. but through a 1 in 9 twist Bushmaster, I put several 10 shot strings all touching. good for me. I'm not that good of a shot. Need to buy some before they are gone. Great Ammo and Company, I have already recommended this company to several of my friends. Very good ammo and great service from you guys. Will buy from you again. Great ammo and even better shipping and service. Great purchase. Outstanding service and price. I have always had positive experiences with PMC ammo. I'm glad I found Ammoman because of the fast service and best price. All ammo is high but this was about 35 bucks less per 1000.will order more next time. My ammunition got here quickly and was packed nicely. Very happy, I will be ordering again. buying 1000 rounds. I took a hundred to the range today and it worked flawlessly. No problems at all. out of the norm. Didn't have a chronograph, but felt like the other factory rounds like federals and such. Put a big ol grin on my face for sure. This is a deal. will buy more from here without fear. Superb quality, excellent price. Both the Tula and the PMC .223 ammo performed flawlessly. Accurate, zero jams. Very helpful customer service. Order was shipped within an hour after order placed. Great so far I have only fired about 80 rounds, but all is good so far. Fired well. No duds so far. I was pleased with the turn around time from order to receiving. Great Job! Easiest way to buy Ammo, click on your order and three days later its at your door. This stuff runs great in my RRA AR. Good product fast shipping ! Getting together another order! Fast delivery and good for the range. I use it in a Sig 516 patrol and ar 15 pistol. No problems feeding thru our Ruger AR556. Great price & super fast shipping. I just purchased an AR, and was looking for some ammo. I was very pleased with the Price, quality and speed of delivery. You guys Rock! I have purchased ammo from this site many times without a hitch. 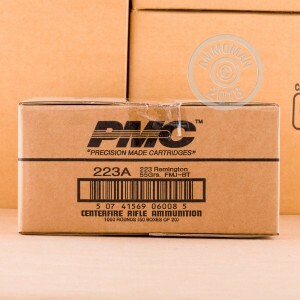 I mainly buy PMC .223, 55 grain ammo and it has always worked flawlessly. I highly recommend PMC from Ammoman because of the great price and quick free delivery. Read some bad reviews I found after ordering this ammo so was expecting the worst. It arrived in just a couple of days and package was in good condition. The ammo looked very nice as did the boxes it came in. Fired one box to sight in a new scope. Every round fired and cycled flawlessly. Groups were tight. Would recommend highly. I have been using this round for about two years in 3-gun matches, this is now my 3rd case. Great ammo for target shooting! Great ammo for the price.. Ammoman cannot be beat! Bought this and 1k of 9mm and it took 2 days to get here. I have cycled 100 through a Bushmaster contractor gun without an issue. Good round at a reasonable price. My colt m4 loves this ammo. Not too dirty, feeds and ejects fine. only have had a chance to run two magazines so far. wish i was able to get out and try the rest. what i did shoot was great. all so was the first two magazines shot through the gun. Great product for the money. Will order again. Shipping was super fast, ammo as advertised. Have only had time to shoot a small portion but has performed well. Excellent service and fast shipping as usual. Cheaper and easier than getting it locally. Ammo worked great. No jams prefofmed reallygood. Have bought Numerous rounds of several different type and never have had a issue. Best price and ships quickly right to your front door. Better than waiting for a sale a local sporting goods store waiting in line and using a coupon when you can get them delivered at or below sale price and no tax or shipping. Have turned a number of people onto your site. Just shot about 800 of the 1000 round box at a 2 day AR carbine course over weekend. It fed without a problem in my Ruger AR556 and I am also going to purchase another 1k rounds and highly recommend it to everyone. PMC ammo, good stuff. Would like to chronograph ammo to get FPS. Ive used PMC for years and have put some back for "hard times". Stores well. More accurate than some of my rifles (or perhaps it's more accurate than I). Have some I stored away 30! years ago, it still functions well in my older Colt and original Bushmaster rifles. Prefer the slower twist 20" bbls but works fine in 1/9" Bushie and 1/7" Colt M4. It's not legal deer-hunting ammo most places but Im pretty sure it would bring down deer at closer ranges (altho Ive not tried this).. The best online site for your ammo needs!!! Placed order on Wednesday before noon. Ammo was on my porch Thursday when I got home. Apparently these guys have a warehouse in Knoxville (GO VOLS). I am 130 miles east of there and FedEx had it delivered within 26 hours!! Very happy with the price and lack of hassel order arrived in efficient time frame and can not wait to order more. Will be trying the ammo soon, pleased with the delivery. Great ammo. Competitive pricing. Fast and free shipping. By far the best and fastest and easiest transaction online. Highly recommended and will use for all my bulk ammo buys from now on. Ammoman ships fast and has it in stock. PMC is great ammo for the price. A great product that goes bang every time the trigger is pilled. Shipped Fast and Free from Ammo Man! Shipping was fast and ammo is good ammo. Very fast and easy transaction. Highly recommend ammo man. This is my second 1000 round order of the PMC Bronze 55 grain. It cycles flawlessly through my Stag-Arms and M&P 15 Ar-15s! Highly recommended for the price. Arrived in less than a week, product exactly as advertised. I've used this PMC before, works well for me. My first AMMOMAN purchase. I will be shopping here again. Thanks AMMOMAN. I strongly recommend this ammo and I VERY strongly suggest doing business with Ammoman! Got a box to shoot for my SIG 516. Had one misfire and problems with the bolt holding open after last round (only shot 80 rounds so far). Found that the pressure of this round is not good for break-in. Buffer spring very high tension and SIG recommends using 5.56 for break-in or a heavier 223, like 62 gr.